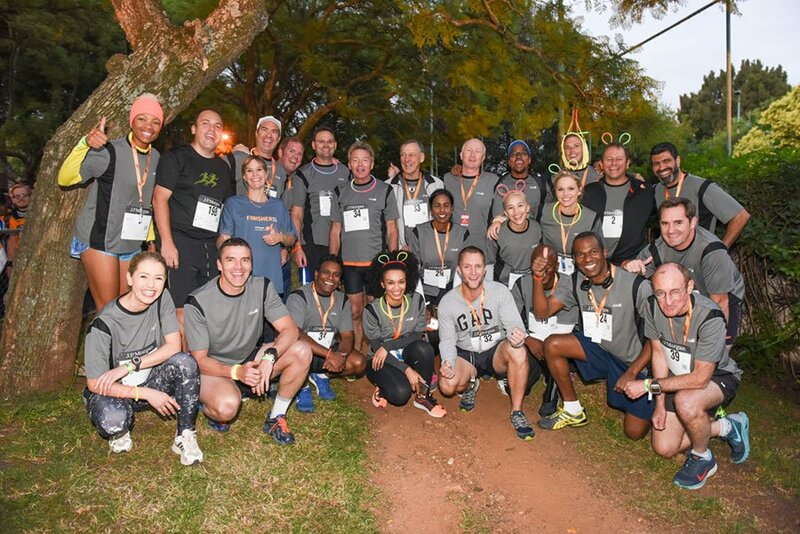 A record total of 13,796 racers, joggers and walkers from 237 South African companies warmed up the autumn air at the J.P Morgan Corporate Challenge® at the Wanderers Club. It is the 13th consecutive year since its inception in 2004 that the Johannesburg leg of the global Corporate Challenge Series has sold out, and the first time it was held in April instead of the usual March date. 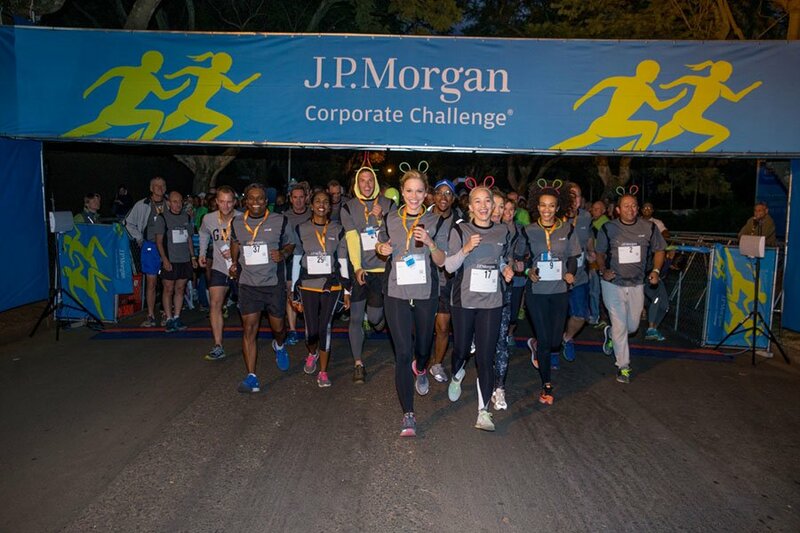 The Johannesburg race kicked off the 40th J.P. Morgan Corporate Challenge Series in style with the corporate community to move their competitive nature from the boardroom to the streets. The Series began in 1977 in Central Park, New York with 200 runners from 50 companies, and has been conducted every year since, growing into a 13-city, seven-country, five-continent global celebration of workplace fitness and camaraderie. Known as the healthiest and largest after-work employee event in the world also serves a deeper purpose, as a donation is made to a non-profit organization annually. The Laureus Sport for Good Foundation, which currently supports 15 sports-based community initiatives nationwide, was the event beneficiary for the third consecutive year. The Laureus Sport for Good Foundation uses the positive power of sport to tackle society’s most pressing issues, and since its inception has raised over R80 million for projects and programmes which have improved the lives of more than 80,000 young people. J.P. Morgan made a donation on behalf of all participants towards funding the Foundations Youth Empowerment through Sport (YES) programme, which focuses on equipping youth with the technical, vocational, entrepreneurship and life skills needed to develop sustainable livelihoods. 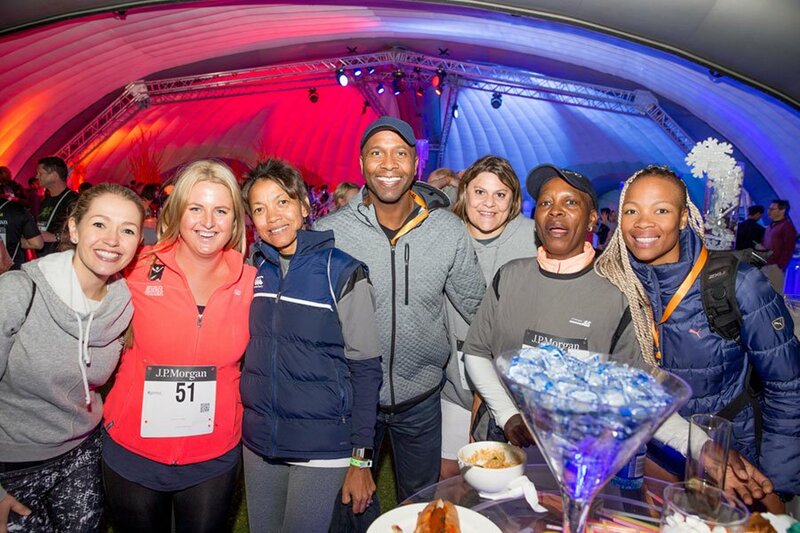 Laureus ambassadors Lucas Radebe, Cynthia Tshaka, Zanele Mdodana, Deshun Deysel, Dan Nicholl and Natalie du Toit came out to show their support and participated in the race as well. While the novices brought some colour and energy to the race, it was the serious runners that brought the competitive edge. Olebogeng Masire, representing Sibanyegold claimed first place as he crossed the J.P. Morgan Corporate Challenge® finish line in a time of 19:18 with Tshamano Setone of Passenger Rail Agency of SA finishing in second place clocking 19:26. They were followed by Ntiti Konana of Sibanyegold in third place in a time of 19:32. The race also attracted the South African Sporting and Entertainment Celebrities such as Bakkies Botha, Former Springbok Rugby player; Natalie du Toit, Olympic and Paralympian; Hayley Owen, Actress; Pearl Thusi, Actress; Chris Forrest; Jessica Nkosi, Actress, Father and son duo Marks Maponyane and Maps Maponyane; Zanele Mdodana, South African Netball Player; Deshun Deysel, Mountaineer; Dan Nicholl Talk show host; Matt Mcgillivray, Highveld Lions Cricket Player; Vaylen Kirtley, Letshego Zulu, Survivor Runner Up and Fitness personality. Representing Passenger Rail Agency of SA, Tebogo Masehla was the first women to finish the race with a time of 22:27 while Ricci-Lee Brookstone of FNB clinched the silver in 23:56, and Carmen Caldwell (KPMG) crossing in third in 24:21. Male Winner: Olebogeng Masire finished in a time of 19:18. Each team had to consist of at least four employees from all types of companies, big and small, but runners could not enter as individuals. The 10 largest companies, which participated in this year’s event, were spearheaded by Standard Bank with the biggest contingent of 700 entrants. Female Winner: Tebogo Masehla finished the race with a time of 22:27. The other nine consisted of KPMG (500), Investec (499), Liberty (460), Deloitte (400), PwC (400), Rand Water (400), Transaction Capital Limited (330), Rand Merchant Bank (300), and Dimension Data (299). Individual results (with a search feature) are available at this link and full men’s, women’s and teams results will be published before the end of the month after eligibility verification of the top runners. The event culminated some top-class entertainment with this year’s post-race concert being headlined by Beatenberg, which was followed by DJ Vin Deysel. The beats got participants moving in the chilly conditions with their fresh pop sounds. The next stop on this milestone year for the J.P. Morgan Corporate Challenge is Singapore, with a 5:30 p.m. race start on the island city-state’s Esplanade Bridge.